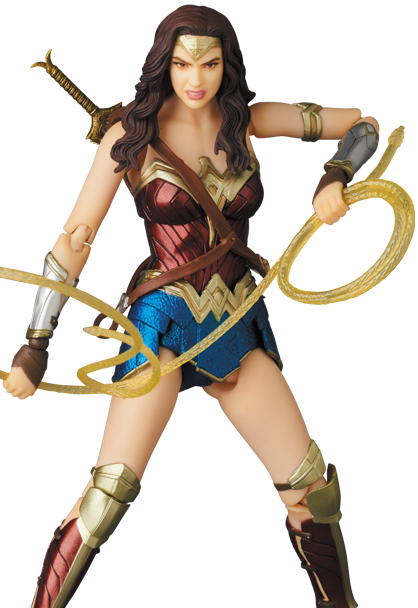 The second DC Films figure revealed today is Wonder Woman. 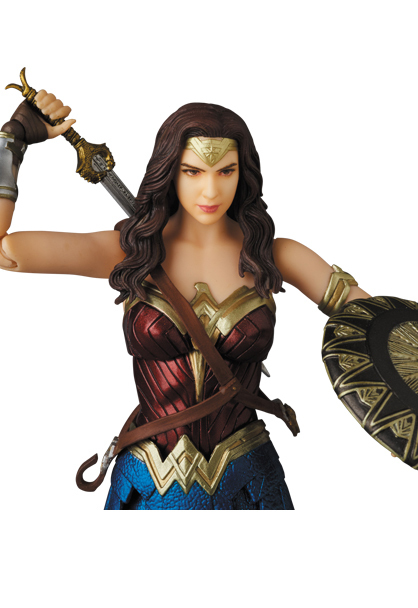 This is the second version of the Gal Gadot Wonder Woman to be released by Medicom. The first was based on her appearance in Batman v Superman: Dawn of Justice. 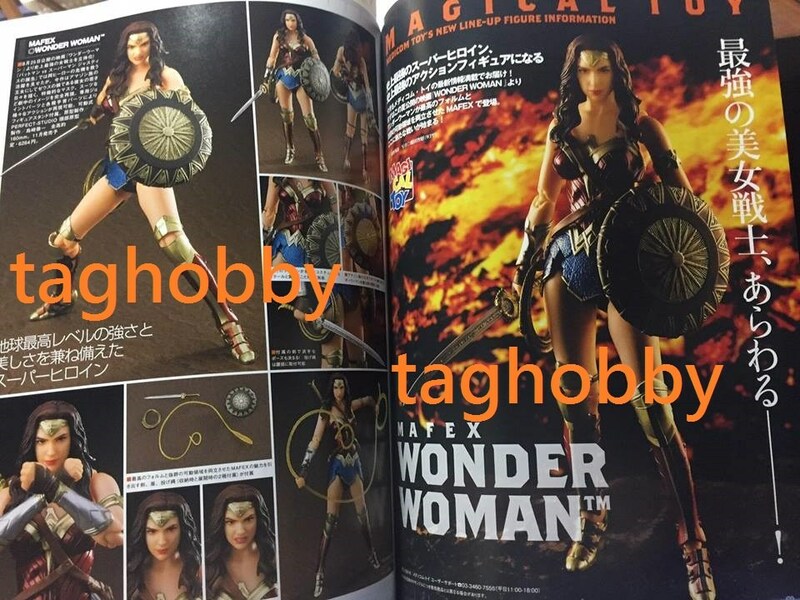 The upcoming figure is based on the new Wonder Woman movie. 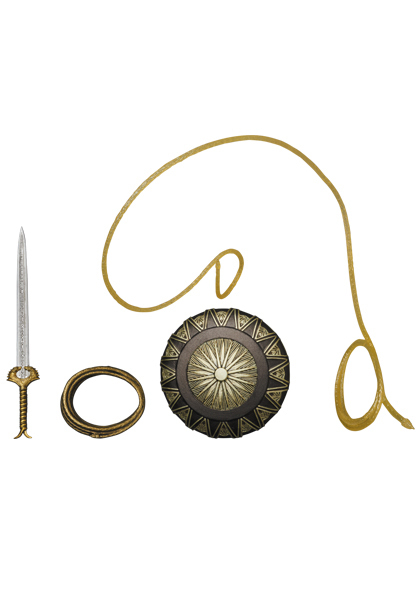 The updated figure includes interchangeable head sculpts, the Sword of Athena, a shield, two version of the Lasso of Truth, multiple interchangeable hands and a figure stand. 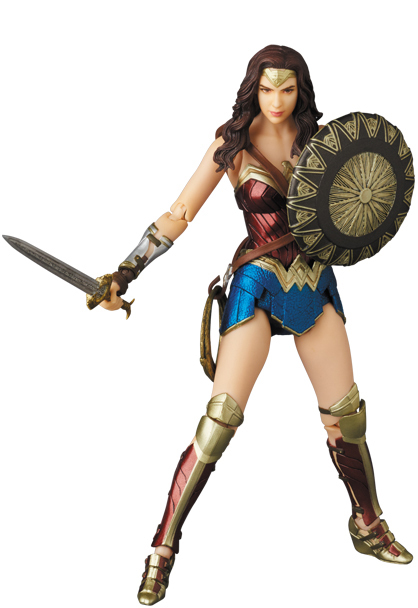 Wonder Woman stands about 6.3″ tall. 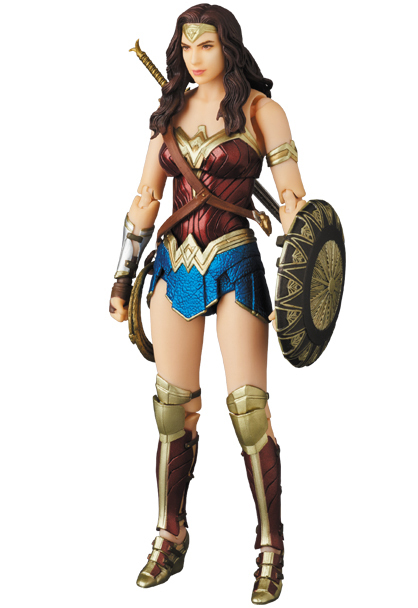 Look for the new Wonder Woman Figure to hit shelves in November. The figure is priced at 6,800 yen (about $61 USD). You can see the new photos by reading on. 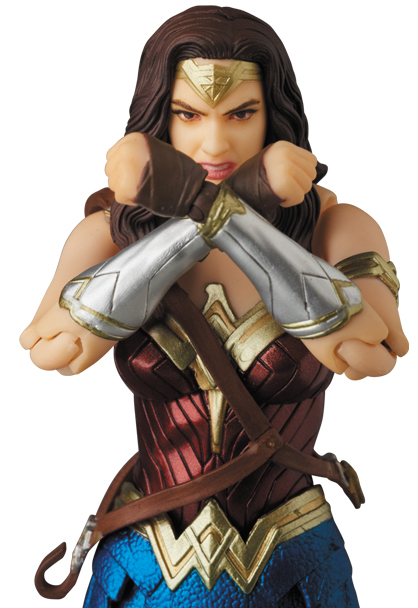 I KNEW I held of on BvS Mafex Wonder Woman for a reason. This is awesome! And the Batman Begins looks solid enough. 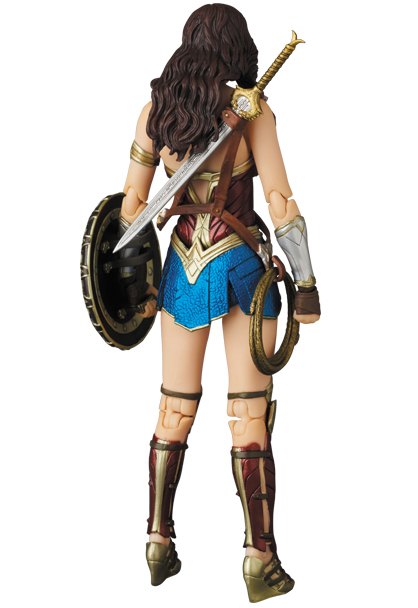 Iam glad that i had waited for this wonder woman figure , i'm not worried about the shield and sword , because when i knew her she didnt have one, so i am hoping that this movie one will be much better head sculpt wise than the BVS. Hopefully they get it right the 2nd time if not got wait for that justice league movie. YES! After some lackluster reviews, I was holding off on the BvS WW until it went on sale, but now it looks like I can skip it altogether! It really stinks for those who picked up the first run though. . . I had absolutely no luck finding the NECA 6" BB Batman figure, but now it won't matter either! The Mafex looks so much better. Both are must buys for me! I have the Batman 2.0 from Mafex and fantastic figure. I already have 2 or them as greed got in the way. That WW looks nice. I hope it looks as good as those pics. I'm all in. I had absolutely no luck finding the NECA 6" BB Batman figure, but now it won't matter either! The Mafex looks so much better. Technically it was a 7" figure but that's besides the point, it would be insulting if the Mafex one wasn't at least in some way better since it costs more than twice as much. I have and very much enjoy the NECA BB 7" figure largely because it was so affordable, if it had cost any more than $20 I would probably be more vocal about my gripes. I picked up the regular Batfleck last week. I am still blown away. That Batman Begins Bats looks great. I wish I wasn't so afraid to pull the trigger on the TDK version. iam still asking myself what happened with Bandai / S.H. Figuarts. They do not add Unmasked Heads to their Figures anymore. I mean, what are they doing??? Is Bandai sleeping? It seems they do not want our Money anymore. Mafex on the other Side makes everything right this time. The Batfleck Unmasked Knightmare Version has been delayed - i can't wait to get the Figure. the unmasked Head Sculpt is even better than the last one from Dark Knight 2.0 Version, now that Mafex is also using the 3D Print Technology. LOL Mafex over NECA, not sure about that. The eye balls were my only real complaint with the NECA one, but I found a pretty good one. Plus it's 7" scale and only $20. after seeeing these new images i might get both figures , look really good. 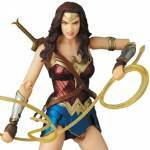 The face make or break a figure that's base on a person, that's a nice Wonder Woman, I just don't see any Gal Gadot in it. Oh that Batman looks so cool. Wonder Woman still looks good! I hope the QC issues are a bit better this time around. I do have fears about the Batman Begins. I love that suit, but it seems like it might suffer from the muddied/dirty look instead of textured/highlighted like they might be intending. Both of these figures look very nice, don't they? Compliments to the team at MAFEX. I don't care if WW looks exactly like Gal Gadot so long as she looks good generally, and that certainly seems to be the case here. These look to be the best versions up to this point. I think I'll snag both. P.S. Look at those great Peanuts figures! I wonder if they have a good Red Baron Snoopy? Addendum: The Peanuts figures are available at BBTS. 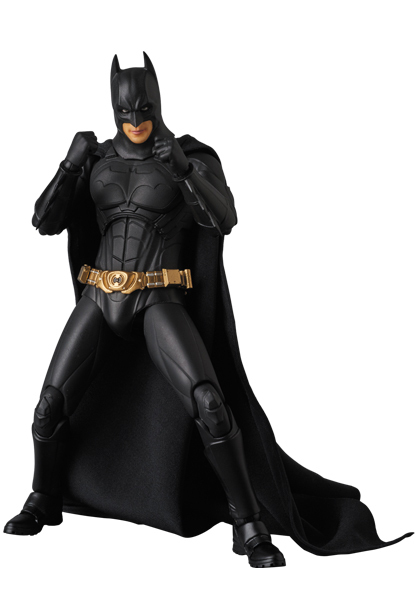 i had a feeling that Mafex would screw up the cowl by adding neck articulation, and so they did. The only companies that got it right was Hot Toys and NECA. This actually looks like a scaled down version of the 12" scale Takara figure. I get that people want articulafion, but this just ruins it for me. Bale's likeness is so so as well. I was never a big fan of the all black Begins suit but it does look nice here- doubt I'll pick it up though since Affleck IS Batman now and my DC movie shelf can't support 2 Batmen... 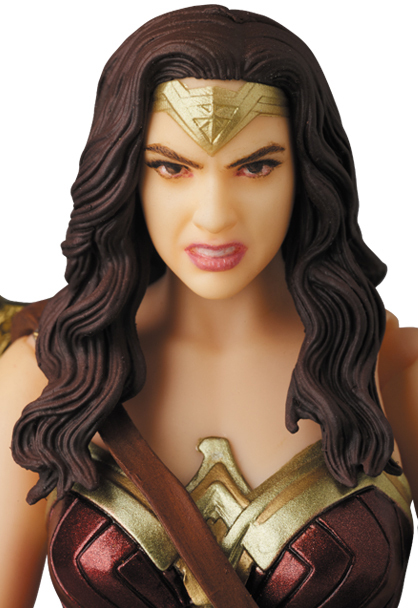 I also have no problems with BvS WonderWoman- it's an amazing figure, so unless this one offers more than "snarling" face I'll probably skip it. It is probably the best Batman in my opinion, Im just fearful of the joints issue with Mafex, as most of their figures have loose joints problem which cannot be fixed at all.